In today’s digital world, social media is a staple tactic within most marketing strategies, with 92% of companies considering social media important for their business. But as a widely adopted tactic, many brands and marketers are finding it more challenging than ever to stand out in news feeds, grow their follower base, and maintain or increase engagement. Of course, recent platform tweaks aimed at improving user experience have thrown a wrench into the mix, too. If you’re nodding your head in agreement, it may be time to get more creative and deliberate with your social media marketing strategy. How? By designing and launching a unique social media marketing campaign or contest to liven things up. Social media campaigns and contests are targeted events or promotions that have a specific focus and goal, and are integrated into your overall social media marketing strategy. For me, some well-known examples that come to mind are the ALS Ice Bucket Challenge and Dove’s multi-faceted Real Beauty campaign. 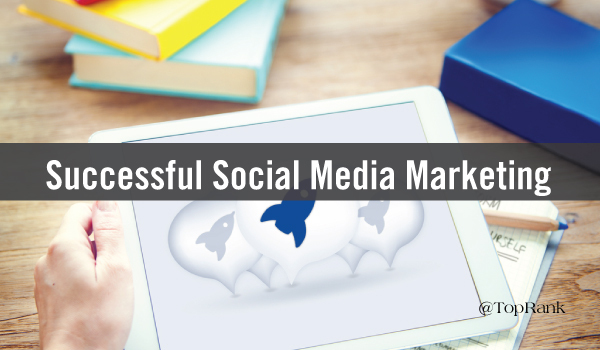 So, if you think a social media campaign or contest is a good next step for your marketing efforts, consider some of the following tips to help you find some success. #1 – Create a detailed campaign strategy. Taking the time to create and document your campaign strategy will help you think critically about your campaign goals, how you’ll execute tactics, and how you’ll measure success. In addition, your strategy can be used as a handy guide to keep you on track throughout the life of the campaign. How will this campaign fit into my overall social media marketing strategy? #2 – Offer something of value. People need a reason to pay attention and participate in your campaign or contest. Discounts and giveaways are certainly powerful motivators. 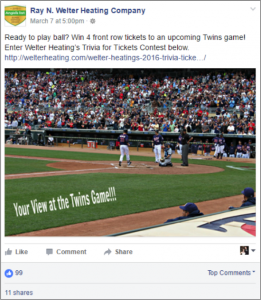 As an example, TopRank Marketing client Welter Heating, a family-owned HVAC company, put on a social media trivia contest, with the prize being sets of four front row tickets to an upcoming baseball game. The goal was to drive social awareness and engagement, as well as website traffic. Calls for entries were posted on their main social media pages and a small budget was allocated to sponsored Facebook posts. In the end, we saw a 166% increase in overall website traffic as compared to the same period the previous year. The contest even generated a couple calls for service. But it’s important to note that your offer doesn’t have to start and end with a valuable prize. You can also offer value by promoting your participants contributions. 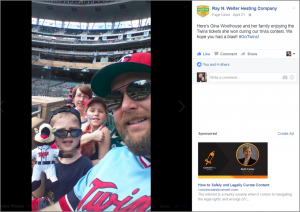 For Welter Heating, that meant highlighting winners in a blog post and also sharing images of them enjoying their prize winnings. #3 – Research campaign and contest rules. Each social media platform has unique rules and guidelines for conducting campaigns and contests. Do your homework ahead of time to make sure you know and understand the rules so you don’t face consequences later. #4 – Don’t forget SEO best practices. All social media platforms contain their own search engines and many of them can be indexed by Google, Bing and other third-party search engines, making SEO an important component of any campaign or contest. Before launching your campaign, compile a list of targeted keywords, as well as any relevant hashtags, that you’d like to rank for socially. Once you have your list, conduct native query searches for the terms to discover who or what kind of content is coming up in searches. Theses insights can help you refine your keyword list, ensure relevancy, and potentially get a glimpse of the competition. #5 – Create a campaign or contest landing page on your website. If one of your objectives is to drive traffic to your website or a specific asset on your website, creating a tailored landing page is a must. A landing page can help assure your audience that they’ve landed where they need to be to take action. It’s also helpful for tracking how your audience is engaging with your campaign content, rather than just sending them to the homepage. #6 – Actively engage with participants. Whether you’re tracking comments, mentions or hashtags, use your preferred social media management tool to keep pace with activity so you can quickly respond. If you’re in the market for a new tool, there are several options—both free and for a fee—out there. Some of those options include: Hootsuite, Tweetdeck, Sprinklr, Spredfast and Buffer. Choose the one that best matches with your budget, goals and the networks you’re using. #7 – Repurpose the UGC you receive. If you’re asking your audience to share photos, stories or feedback, their responses can be great fodder for blog content or additional social promotion. BeCharming.com, a certified-PANDORA retailer based in Minnesota and a TopRank Marketing client, launched its #BeCharming campaign in the spring. The goal of the campaign is to encourage PANDORA-lovers to share how they express themselves with PANDORA jewelry through photos on Instagram. Several of the submissions have been featured in related blog posts. 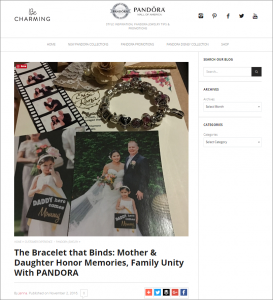 One of the most recent stories discusses how PANDORA has helped a mother and daughter honor special memories and grow their bond. Social media campaigns and contests can be an effective way to add some lift to your social media marketing efforts. The big thing to remember is that your campaigns and contests don’t have to be huge productions with a ton of money behind them, but they do need a thoughtful strategy with your audience and their needs at the center. What social media campaign or contest has really resonated with you? What can other brands and marketers learn from it? Share your thoughts in the comments section below. Disclosure: Pandora MOA and Welter Heating are TopRank Marketing clients. Brilliant article, thank you. Packed full of genuinely useful tips. I keep meaning to get to grips with Twitter more and start publishing on LinkedIn, now I’ve got even more incentive to get my finger out…thanks for the prod!